In Store: Various coupons for individual sports gear. In Store: Print or show coupon on mobile to redeem your savings. 20% off one regular priced item, 10% off one sale item. In Store: Print out the whole page and show when you pay at register. Get a 10% discount storewide. 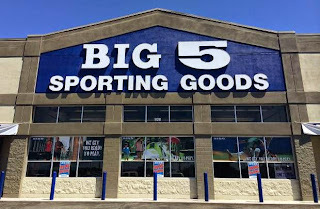 Spend $100 or more in Big 5 Sporting stores and get $25 off. This coupon takes $5 off your entire purchase in store over $25. Get a 10% coupon and exclusive deals when you join their e-team. Buy up to two regular priced items at Big 5 and get 20% off. Same coupon gives you a 10% discount on sale items. Print coupon for a 20% discount on up to four regular price baseball items and/or up to 10% off four sale price baseball items, excludes all Nike products.